March | 2010 | Run. Write. Therapy. Life. Today’s Happy Note: Went to a fun poetry/art event tonight with a friend I haven’t seen in a while (hi Joy!!!!). Okay, no proper post tonight because Caronae is CRANKY. I have tried everything: tea, yoga, stretching, disconnecting from technology, melatonin, magnesium, relaxation techniques, meditation, very active daytime, quiet environment. I repeat: EVERYTHING. I have reached a point of tremendous frustration and have resorted to a prescription. I want to be honest with you guys here since this is my blog about all aspects of health and this is an extraordinarily frustrating (health) situation for me. I don’t understand why I can take care of myself in so many ways — I run, I walk, I do yoga, I lift weights, I savor my veggies and fruits, I do positive self-talk — and still have this one major issue going on. It has gotten much worse this semester. And not sleeping affects everything else in my life: I can’t concentrate in class or at work, I can’t eat at the right times or get my workouts in (although usually I force myself to anyways which ends up exhausting me even more), I don’t spend as much time on homework or with friends as I’d like. All because I waste hours everyday trying to fall asleep or being asleep when I don’t need to be (i.e. the middle of the day). I have tried getting on a regular “schedule”, but my life is so varied that this doesn’t work; the minute I have to stay up late studying until two AM one night, everything is thrown off for weeks. This is not reasonable. This is not normal. I have a serious sleep problem. Insomnia, but also something else, I suspect. I saw a psychiatrist a few days ago to figure out what we can do in terms of medication. I now have a sedative and another anti-depressant that works as a sleep aid. I have been taking this second medication, we’ll call it T for about three days now and I feel absolutely bizarre. I feel hungover all day and downright drunken when I wake up. This afternoon I was so exhausted that I had to take a three hour nap instead of running and when I woke up, I stumbled around my room and fell into my door and hit my head. Not cool, T, not cool. I then proceeded to lose my phone in my 150 square foot room. Later on, I found it. Sitting in the center of my desk. In sum, I feel at an impasse. I don’t really know what to do. I’ll probably stay up all night tonight since I slept this afternoon and I won’t be able to fall asleep unless I take the sedative and if I do that then I won’t be able to wake up for my morning classes. I won’t lie, I’m angry. Dear Body, I work so hard to take care of you. Why won’t you let me sleep? Love, Caronae. Suggestions? Sympathy? Random things to distract me? 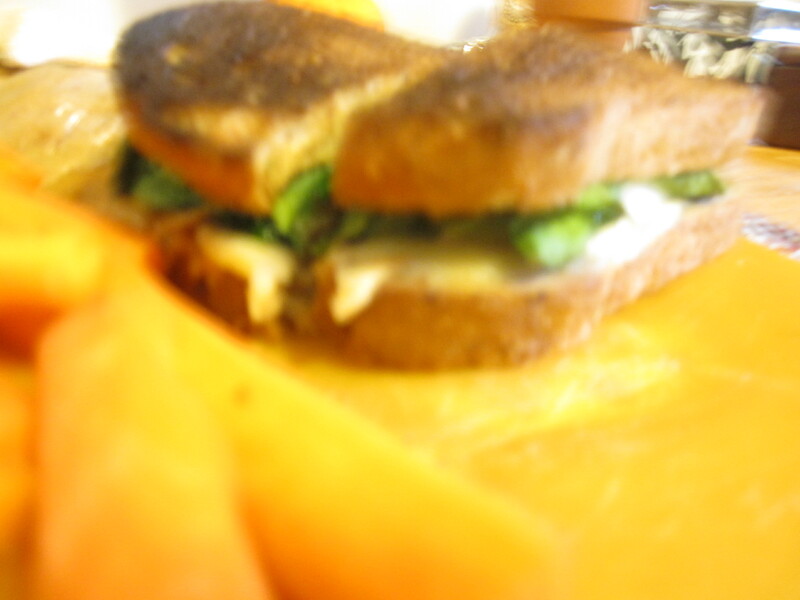 Today’s Happy Note: Coming home after work and class and not immediately passing-out or eating carbs! 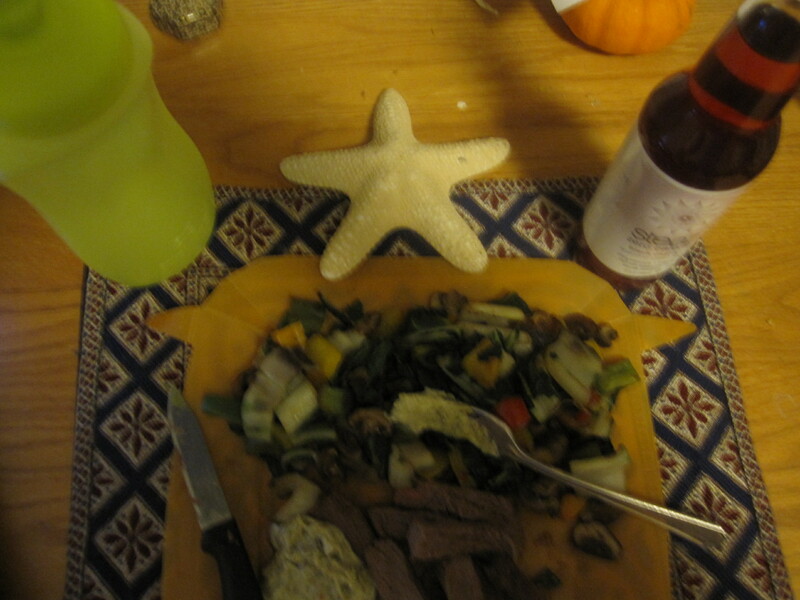 Normally this is a bad habit for me on my longer days (I think it’s a sort of stress-induced exhaustion), but today I did my workout instead, then cooked a nice dinner and savored it! Score one for stress management. Exercise: I did levels 2 and 3 of the 30 Day Shred this evening. Doing more than one level at once is actually really hard! I was screaming at miss Jillian and dripping with sweat by the end. I used to scoff at the idea of having a good 45 minute workout, but this felt really effective. I was planning on doing half an hour of strength followed by six miles of speedwork at the gym, but I wasn’t feeling it. Does anyone else really hate the gym? Maybe it’s just because mine is crowded, dirty, smelly, and not that great. And there aren’t any cool classes. Blech. I can’t wait until I’m in the “real world” with a real job and can have a real gym membership. Scary to think that all of that is only a little over a year away from now! 1. Strength training twice a week for half an hour. This should be manageable; I’ve already done more strength since the half than I have all year (hahaha) and I feel so much stronger! Plus, I like feeling like I can keep up with the boys in the weight room, and that I’m just one of those silly cardio-only girly girls. 3. Continue tracking calories and not mindlessly snacking in the evening. I’ve been doing well with this lately and have noticed that a lot of times when I reach for something tasty to munch on, I’m not really hungry! This is my version of an April shape-up plan. I want to feel even more confident than I already do when I go swimsuit shopping and go to the beach. I want this spring and summer to be the happiest time of my life, and taking care of myself physically is one of the best ways to achieve that. I think I’ll include some mental health goals tomorrow! Other things I’m going to focus on include drinking more water and getting more protein. Gotta make this post short and simple so I can get to bed. I am going to try to wake up early for a long run tomorrow morning. I want it to be far enough out from my ultra that my legs are well-rested! I’m most excited about my Naturally Nutty honey cinnamon pb (not from TJ’s), chocolate covered pretzels and chocolate raspberry trail mix. Yum! Do you have a favorite grocery store? Local or chain? Specialty or discount? Around the corner or a long drive away? Today’s Happy Note: I had the most delicious breakfast with the juiciest blackberries I have ever consumed in my entire life! Exercise: Shred Level 2 (does anyone else think this one is harder than Level 3? It’s those damn v-raise shoulder thingies at the end…) and somewhere between one and two miles of walking. Would have done a bit more but it was raining. A lot. Sometimes I don’t really know how my brain works. But it has gotten me this far in life so I’ll take it, I suppose. So that breakfast I told you about in my Happy Note? I have pictures. Lots of them. It won’t be quite as good as if I could give you all samples, but they shall have to do. Oh the pitfalls of food blogging! 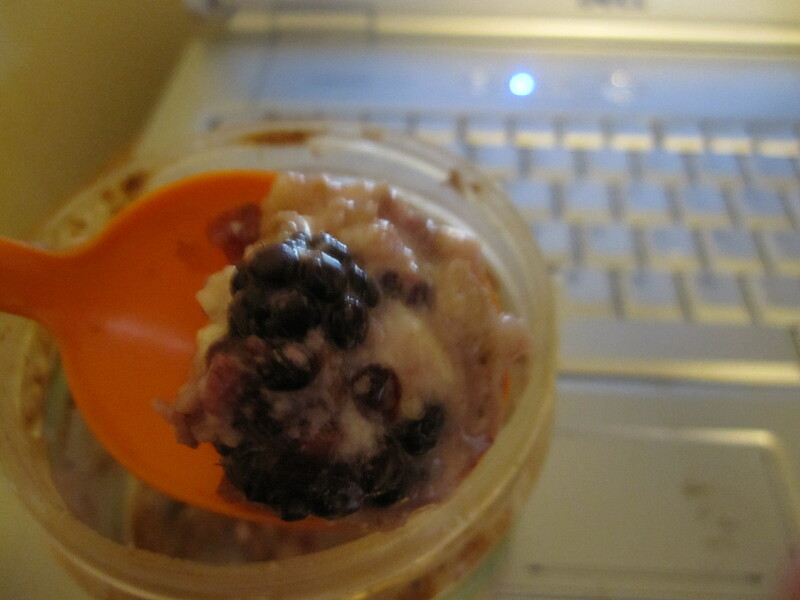 This is Three Sister’s Apple Cinnamon Oatmeal cooked up with water and blackberries then poured into a near-empty AB jar. Topped with a French Vanilla yogurt hat. Look at that purple blackberry deliciousness. Sigh. I might have this for breakfast everyday. For the rest of my life. This is one of the best oatmeal combinations I’ve ever heard. 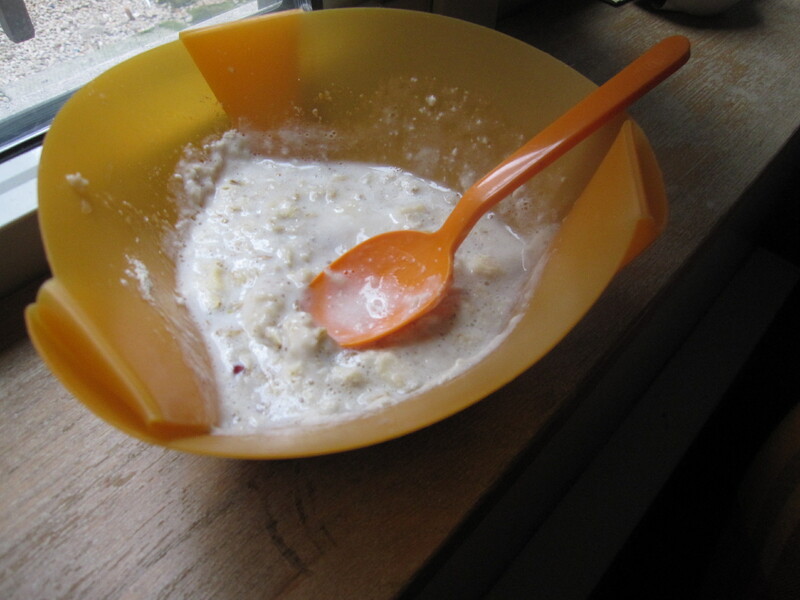 I love trying new fruits in my oats! What’s your favorite fruit or other oatmeal add-in? 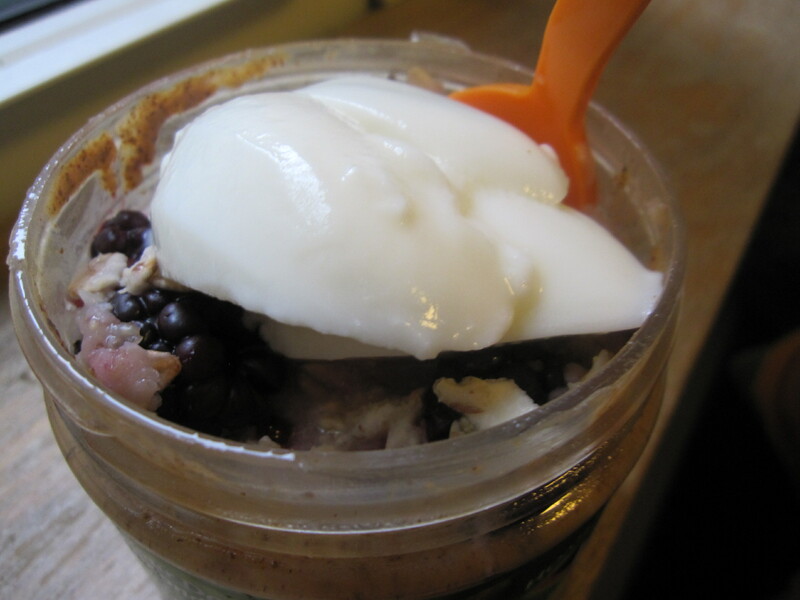 Introducing almond butter and jam eggs. It might look a little funky, but I assure you, this is beyond good. One of my rare moments of kitchen genius. And it’s so easy, your three year old could probably make it. 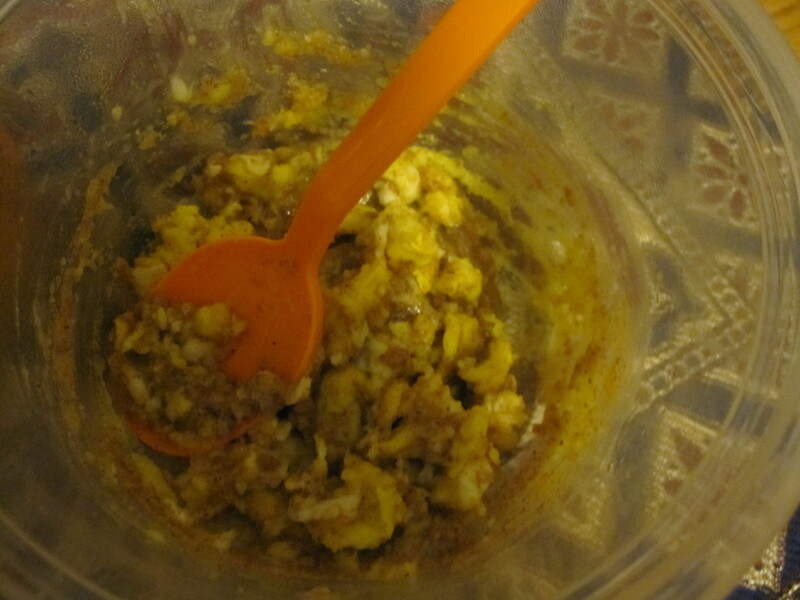 Simply crack an egg in a microwaveable safe bowl and whisk until scrambled. 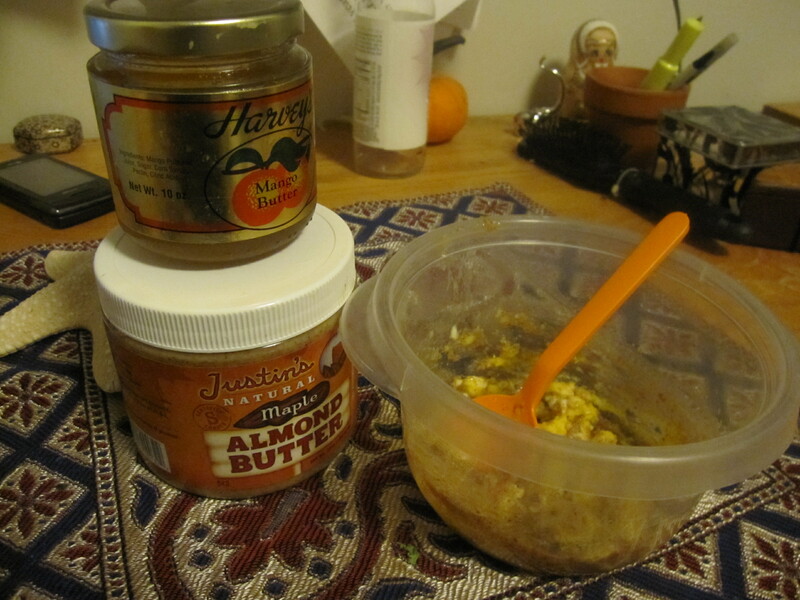 Top with a half-tablespoon (ish) of your favorite jam (I used mango butter) and a tablespoon of nut butter (I used maple almond). DO NOT stir in the AB and jam yet. 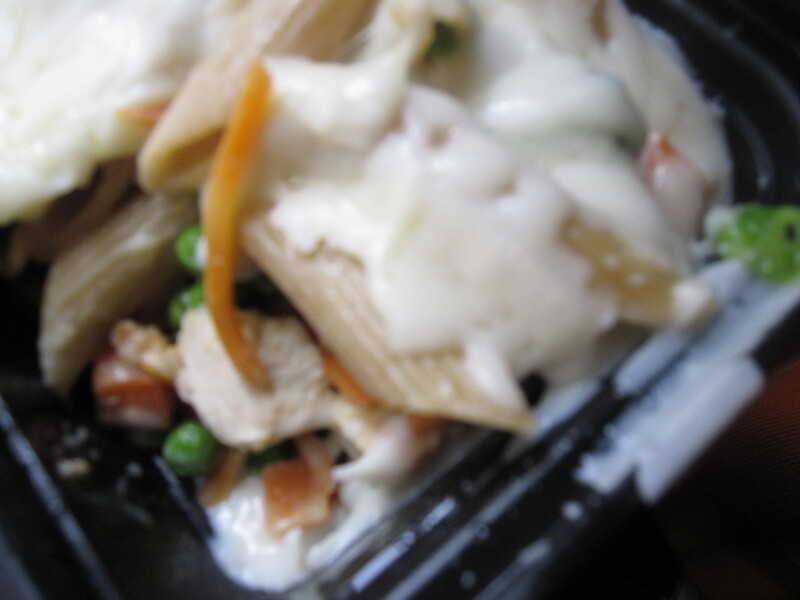 Microwave on high thirty seconds. Take it out and NOW stir everything together. Microwave for another thirty seconds. Consume in about five seconds flat. I actually don’t have a lot to say today, believe it or not. How very un-Caronaeish. I started out talking about running — last weekend’s half-marathon and my upcoming ultramarathon — and then somehow we started talking about professional athletes and endurance in general. It was really nice having a semi-normal conversation with my psychologist actually. I mean we still made insights and I definitely talked about me, but it was nice not having this intense analyzing thing going on for the whole hour. She told me, firmly, that I am an athlete. Sometimes I doubt myself in regards to my athleticism: I don’t win awards or break records, but I do spend hours training every week and pushing myself. So it was nice to hear her tell me that a) I am an athlete and b) I have athletic talents: namely, my endurance. Then we talked a little bit about my family and I shared my scariest childhood memory (already wrote about it so I won’t share again). I definitely experienced inconsistencies in my childhood and hated it; at school/home/family/friends. Whatever it was, I hated change. There were two bad things that my teachers always wrote on my report cards: Caronae does not like change and Caronae does not work well in groups. I think both of them make sense, looking back. And I have gotten soooooo much better at both: I am proud of this. I think my group-work hatred has shifted towards effective leadership and trust, and my hatred of change has morphed into a good thing: today, when there is a major shift or transition, I approach it with caution, but I also let myself simmer in the new joys and feelings that change can bring. Normally when I travel back and forth between MI and NYC, I take days, weeks, or months to adjust to one environment over the other. I noticed that I din’t experience that during spring break, for the first time ever. Maybe I have grown. Or maybe I’ve gotten better at taking care of myself — physically and mentally — and of observing the world around me and making minor adjustments. I think this is it. Today my therapist said something along the lines of “happy people are kind people. I’ve never met a happy mean person.” So true. And guess what? As I become happier I am becoming nicer, and vice versa. I like this. It’s calming to feel like I can finally begin reaching out towards others who may be unhappy or struggling; this in turn helps me feel stronger and just more in-tune with myself. In-tune is a good thing. Off to go spend some time with my main man Marx! Kidding. He’s sort of a weirdo. But a thoughtful, interesting weirdo. 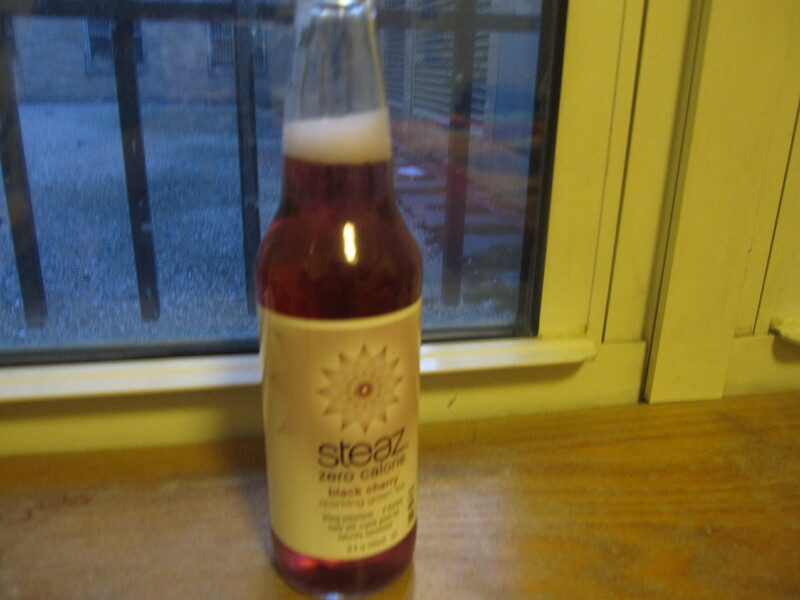 This is a black cherry steaz bottle cap. My last one said “I am powerful.” I think they’re kind of great, and they make me feel happy and strong and unique. 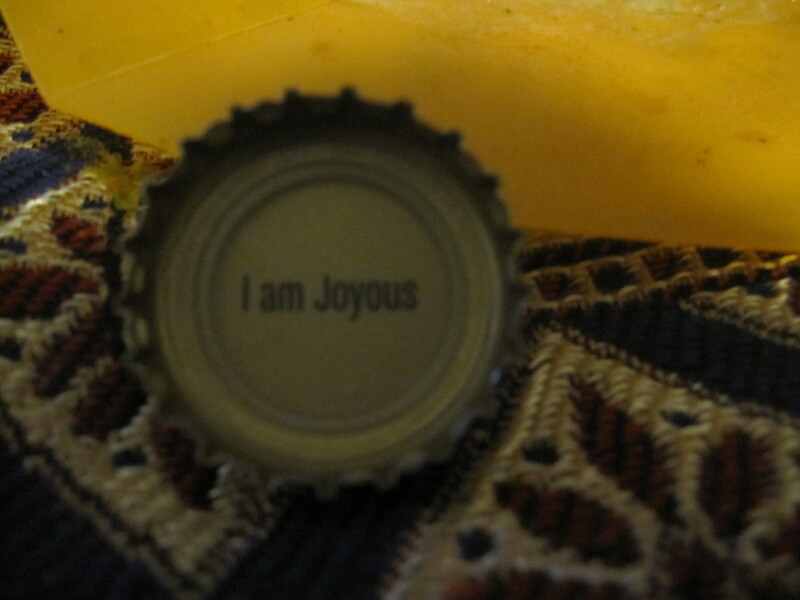 What more could I ask of a bottle cap? 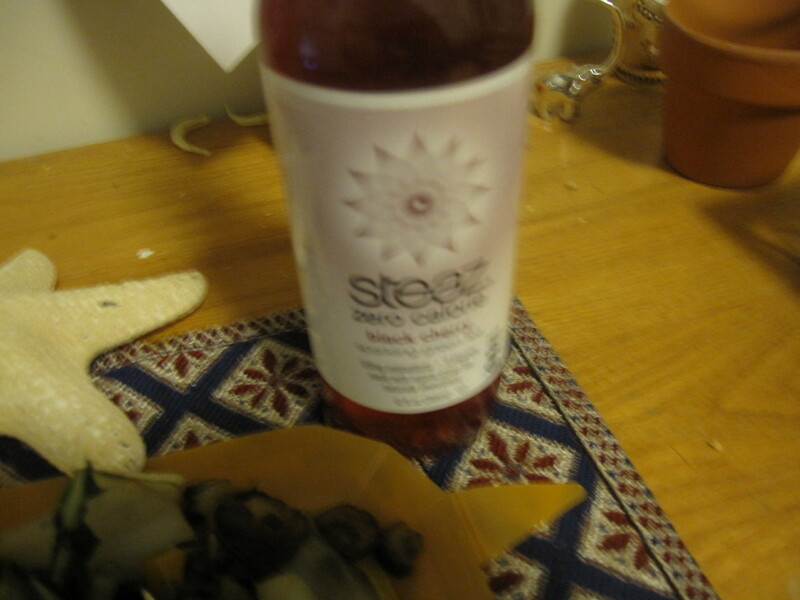 Thank you, steaz! I listened to my body today and she said she did not want to run. So I didn’t! I headed to the gym and did 25 minutes of serious weight lifting followed by 30 minutes of High Intensity Interval Training on the elliptical. I first heard about HIIT a few years ago and then was inspired to try it by Janetha. Basically, HIIT involves a brief warm-up followed by 15-20 minutes of intervals that alternate from easy to, well, high intensity. Pretty self-explanatory. You can vary the ratio of hard to easy depending on how you feel; wikipedia suggests 2:1, I have seen 4:1, and currently, I’m at 1:1. I would do a minute relatively easy (think “jogging” pace) followed by a minute of everything I’ve got. I kept this up for 20 minutes, followed by a five minute cool-down. This sounds easy, and the concept certainly is, but let me tell you it is KILLER. The sprints make it feel like a great workout (and it is) in a small amount of time. 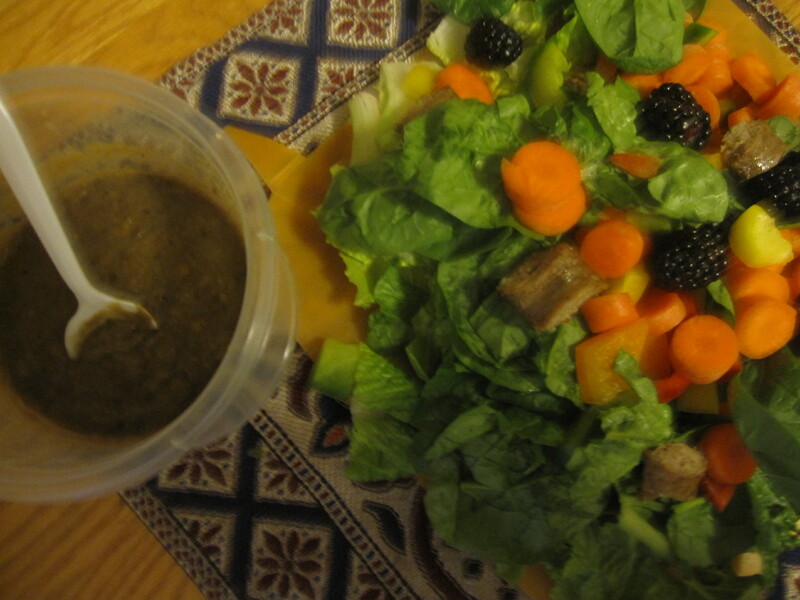 It is, I believe, supposed to burn more fat and be good for anaerobic capacity. I then rotate through the set three times. I like to alternate arms, abs, and legs so that each muscle group gets a little rest but then has to work again. I am not sure how scientific this is, but it works for me. I usually do 3-5 supersets like the one above. For me, and probably for many of you guys, this is obvious. Whether it’s twenty minutes on the yoga mat, playing in the ocean with friends, or a marathon; we get it. But not everyone approaches physical activity this way. I like to think of my exercise time — my 30-120 minutes a day, typically — as primal: the urge to move feels incredibly natural and human to me. I think that deep down, this is true for most people, it’s just that many Americans have gotten out of touch with this. Sometimes my friends question my dedication to running or yoga or laugh when they see me doing a half hour workout dvd. But my body and mind need this time. When I exercise, I actually end up having more energy, I’m happier, and, I think, kinder. It really is like brushing my teeth. Outside of the occasional rest day, I couldn’t not do it. How do you guys feel about this? Is this approach obsessive or just natural? Do you feel better when movement is a part of your daily routine? 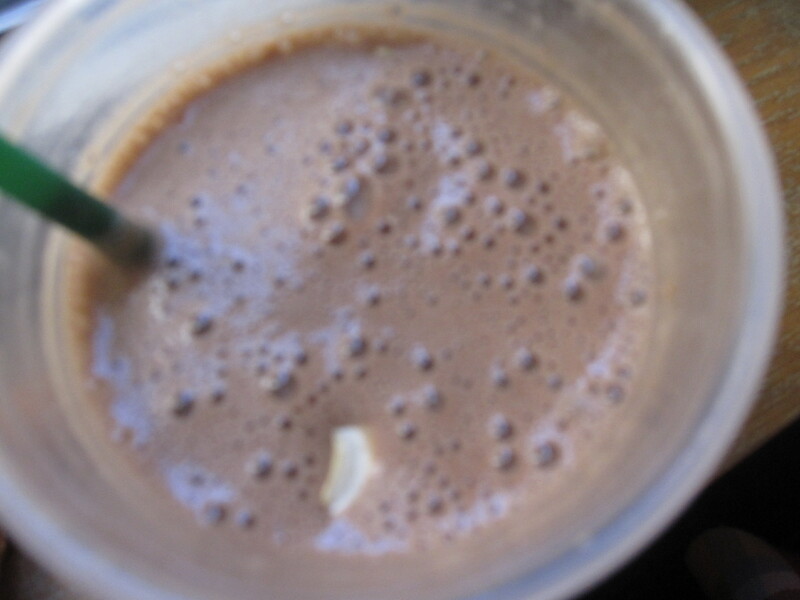 I have been consciously trying to eat every three to four hours, and to include plenty of protein and fats. And I’ve been feeling more satisfied! Go me! This is Three Sister’s Apple Cinnamon Oatmeal with a half a serving of Tera’s Whey vanilla protein powder (which was not gritty and tasted nice and creamy! Yay!). I can’t wait to try the rest of their oatmeal varieties. I am really liking this company so far, go check them out! This was one of the best weekend brunches ever. Well okay, it was three o’clock so I don’t know if that’s really brunching hour. But whatever. 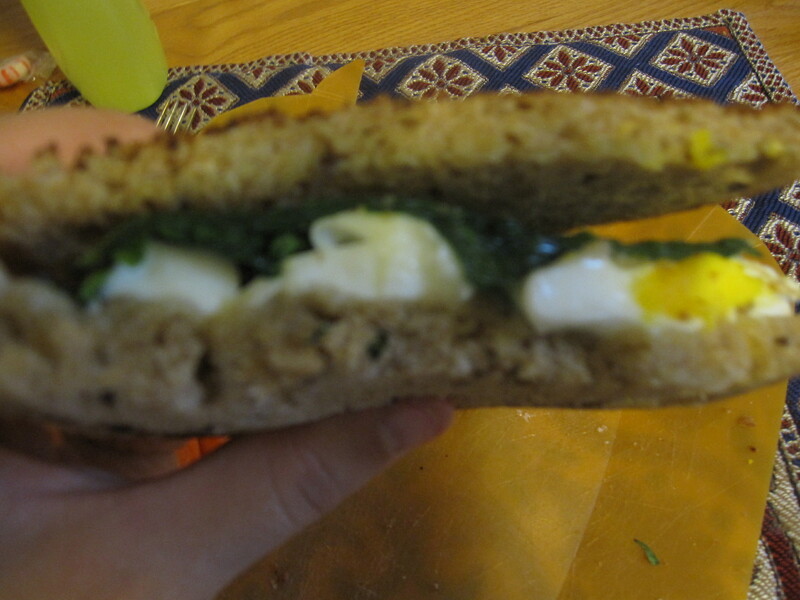 Two eggs, white cheddar, and spinach on whole grain bread, broiled for five minutes (I have no toaster and the broiler is a decent substitute). 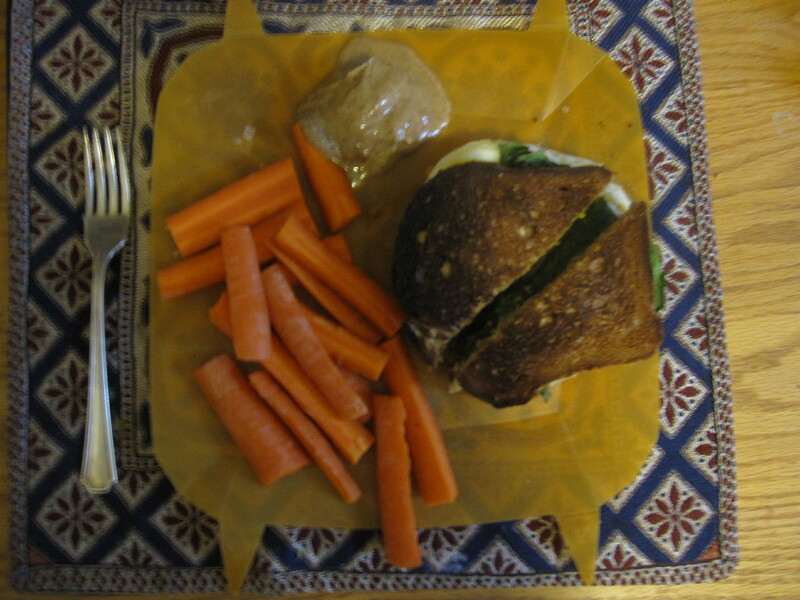 Three large carrots sliced up with two tablespoons Justin’s maple almond butter. This meal was mountains of delicious. 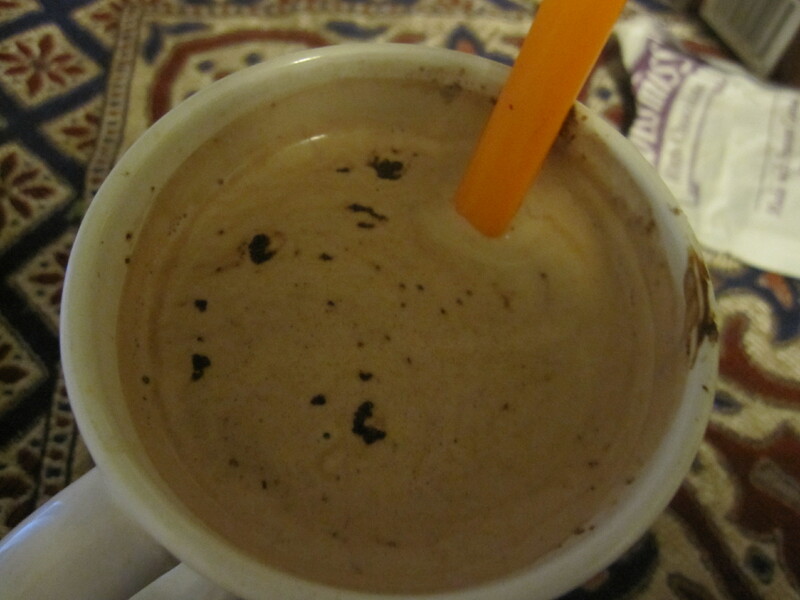 Triple chocolate hot cocoa. Dessert is my favorite part of the day! Minus three ginger cat cookies (tiny) and a similarly small square of cherry dark chocolate, I think that’s everything I’ve eaten for the day! 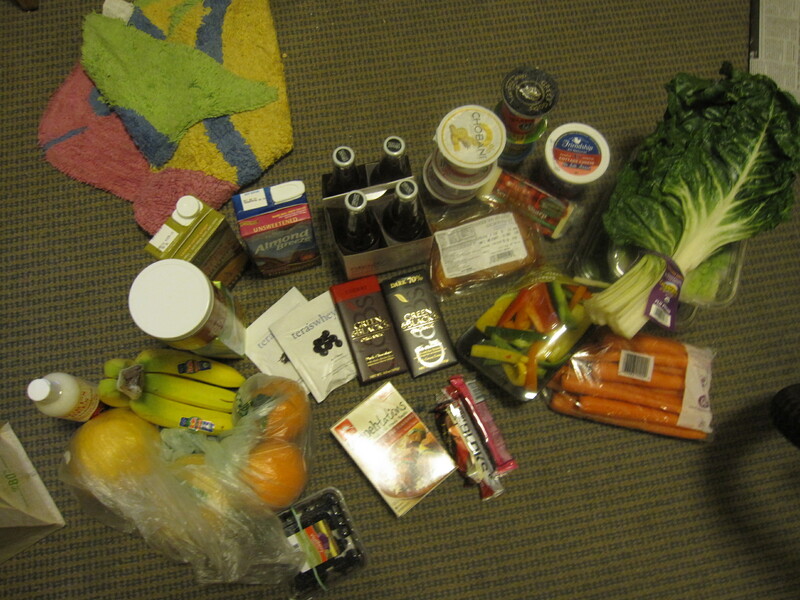 I’ll probably do full day eats once or twice a week, since I like to have a visual record, but don’t want to bore you. Have an excellent week! Make sure to smile and think positive; this will improve everything, I promise. Today’s Happy Note: I had TWO social activities. Hey, that’s a lot for me. I’ve switched from daily creativity notes to happy notes! I was getting bored (and, um, a bit uncreative) and needed a change. So far I’ve done positive notes, mini goals, daily creativity, and now happy notes. The happy note has to be a comment on one happy thing from my day. My friend J and I headed out for our run this morning and he finished so strong! I even made him run up a hill at the end. He was such a trooper; my legs were so dead, I could barely keep up with him! I want to do a long run tomorrow and get it out of the way, but I can’t decide if my legs will be happy and rested. Decisions decisions. Also, my running club is doing a small 5k for charity. I hate 5ks but I feel like I should participate? To race or not to race? To do the long run afterwards or not to do the long run? Caronae fact of the day: I am terribly indecisive. I used to make my parents crazy saying I wanted one thing and then changing my mind at the last minute. Oh wait, I still do that. 1. 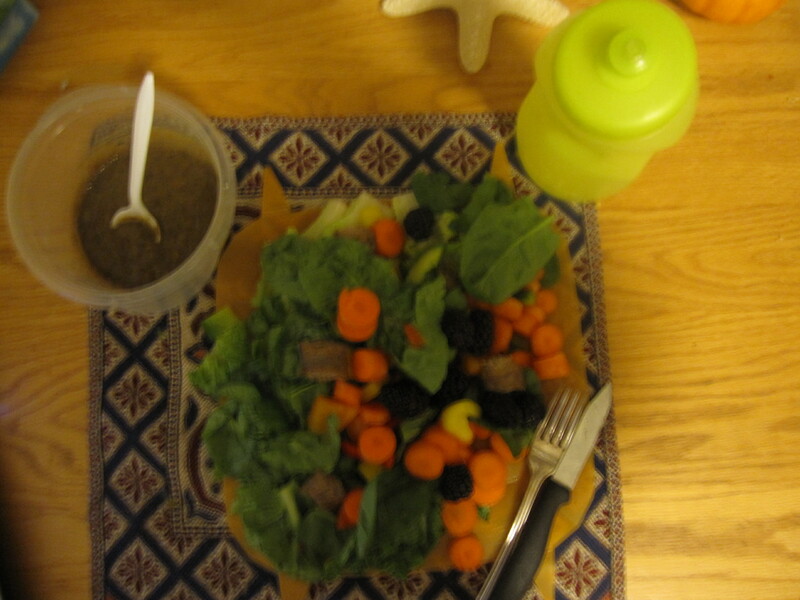 Must hold me over: this means that it should be nutritious. 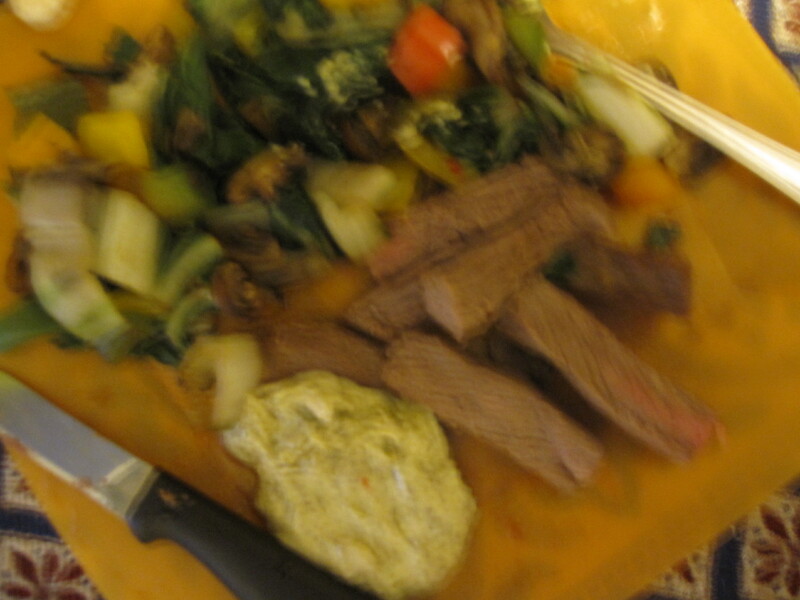 Usually I go fo some (or all) of the following elements: fiber/vegetable matter, fat, protein, smart carbs, deliciousness. 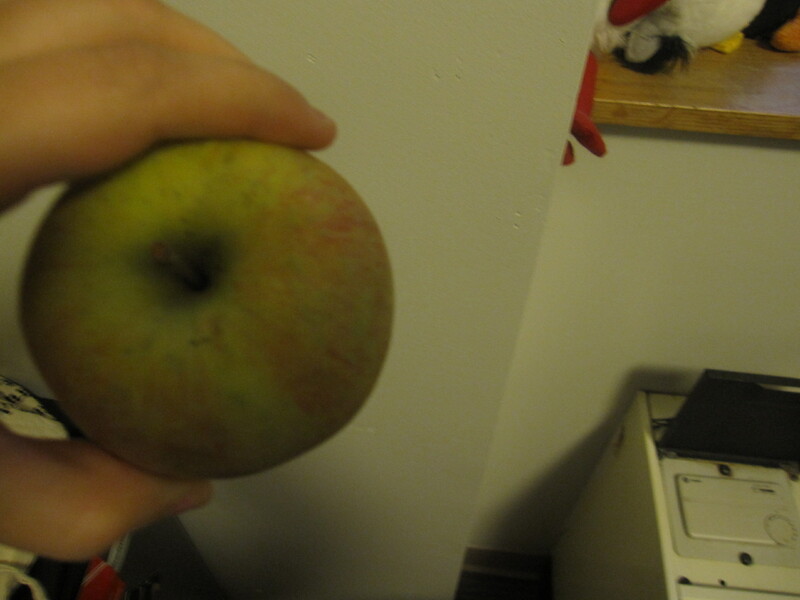 If a snack is healthy as all get out, but it doesn’t taste good, I won’t want to eat it, and will therefore end up just eating what I really crave later on. 3. Nutrition: This relates to number one. You will not see me eating 100 calorie packs or processed stuff. 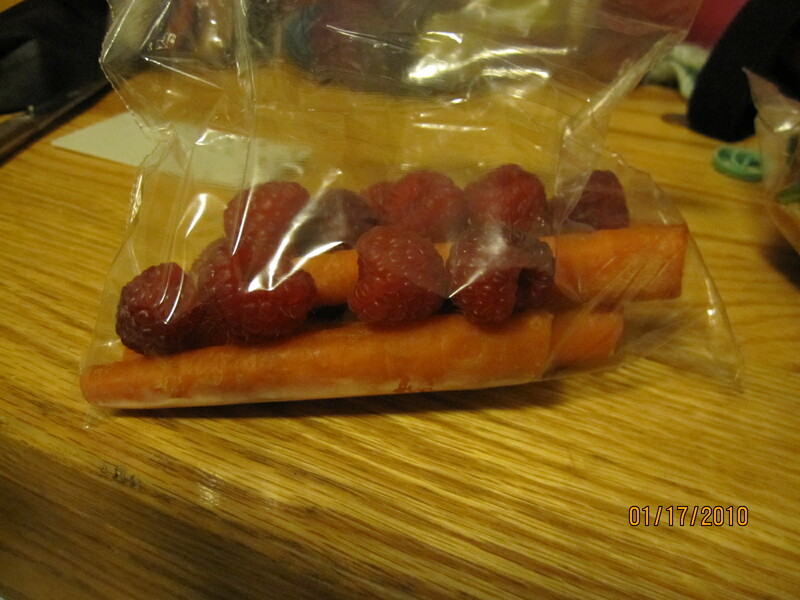 I try to keep the snack as “whole” as possible. 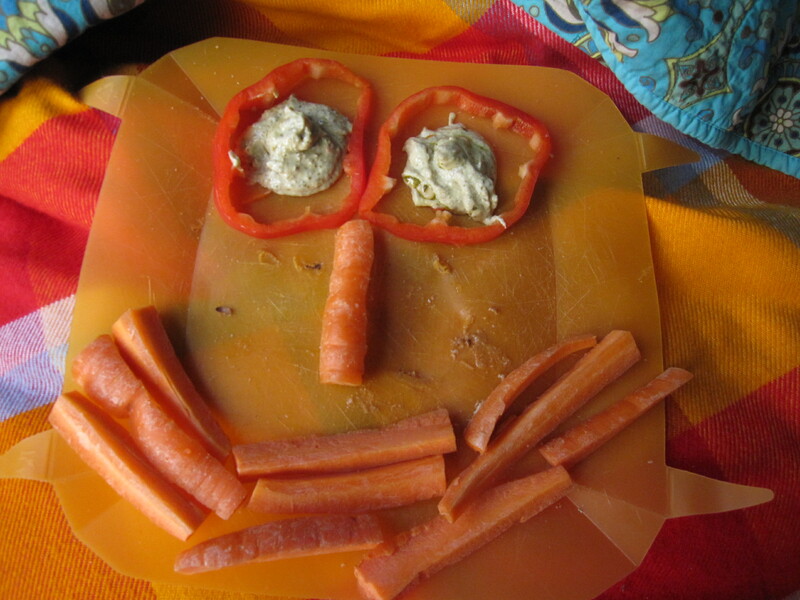 Veggie slices with hummus! 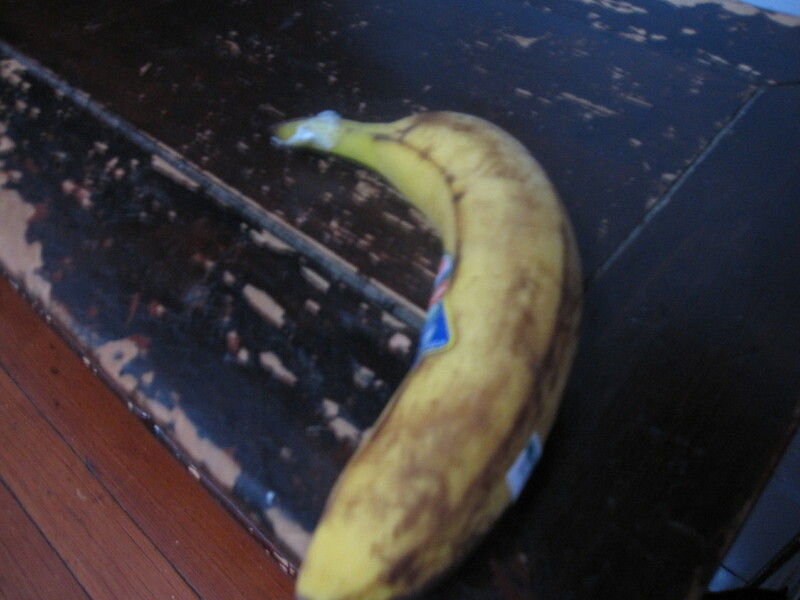 Also can be easily put in a container and thrown in your bag. 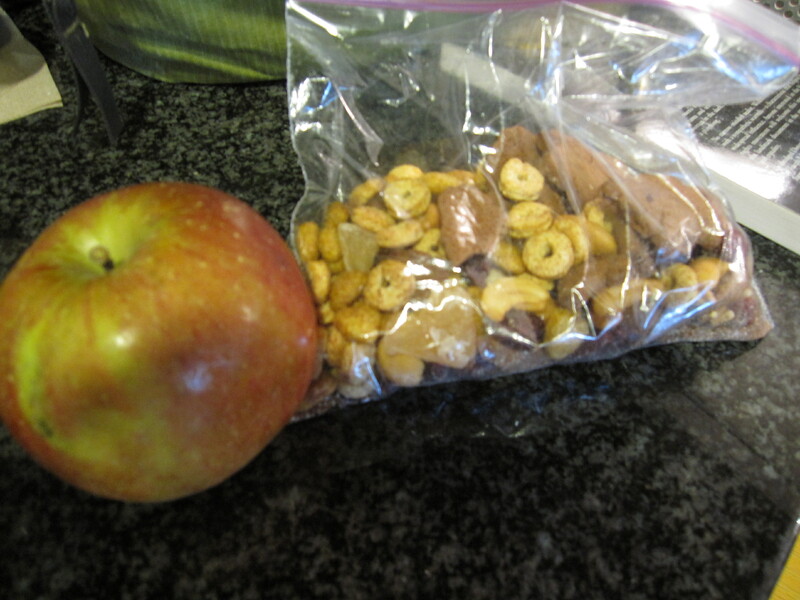 Homemade trail mix and/or whole fruit. I take two snacks if I know I will be out and about for a long time between lunch and dinner. 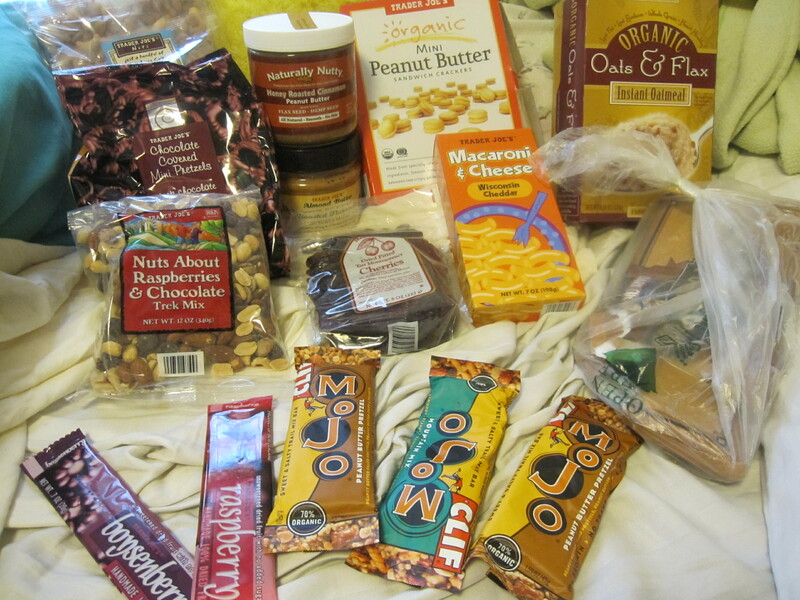 I like the following for fun, unique trail mixes: nuts, exotic dried fruits (think pineapple or blueberries), whole grain cereal, dried edamame, chocolate chips, animal crackers, etc. Good old plain fresh produce! 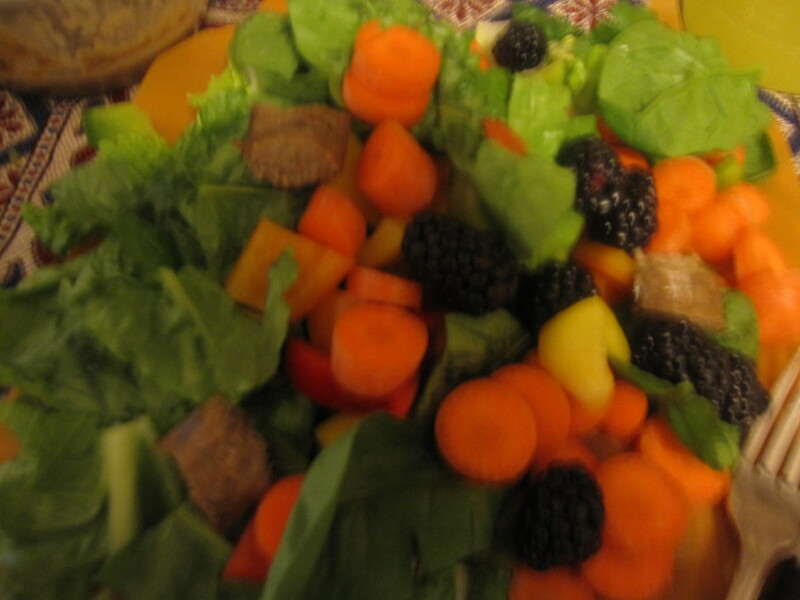 Carrots and peppers are really easy to cut into manageable strips. I also like cucumber and cereal. Snacks like this are perfect for when you have several hours before your next meal and you know you’ll be hungry, but you don’t want to get too full. 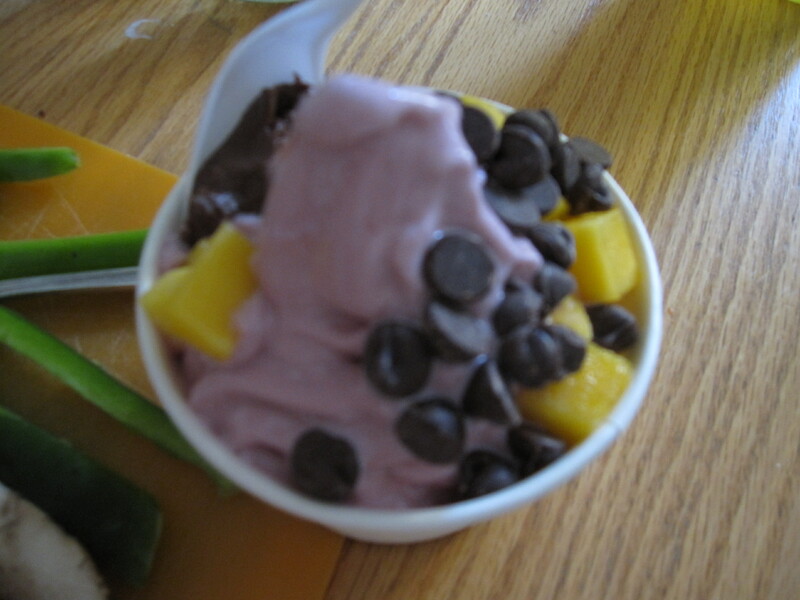 Frozen yogurt with toppings is my favorite occasional “treat” snack! 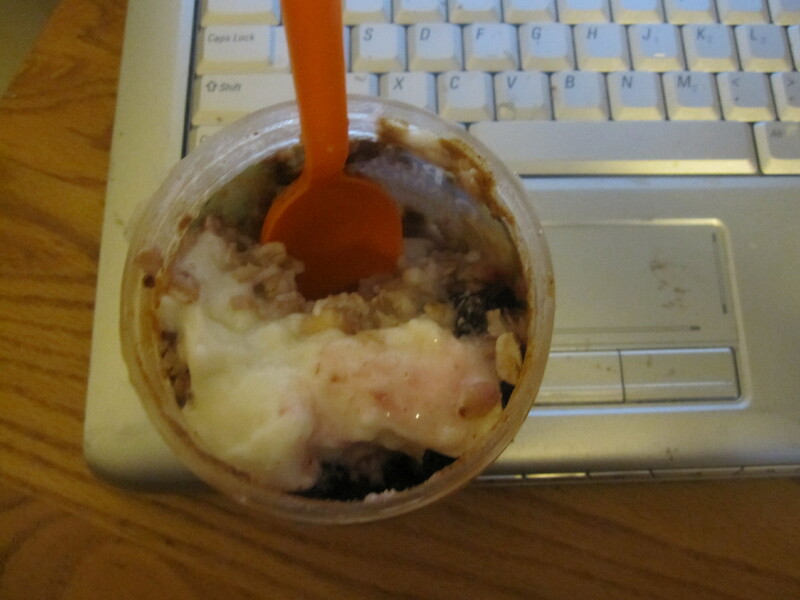 Yogurt with random toppings. 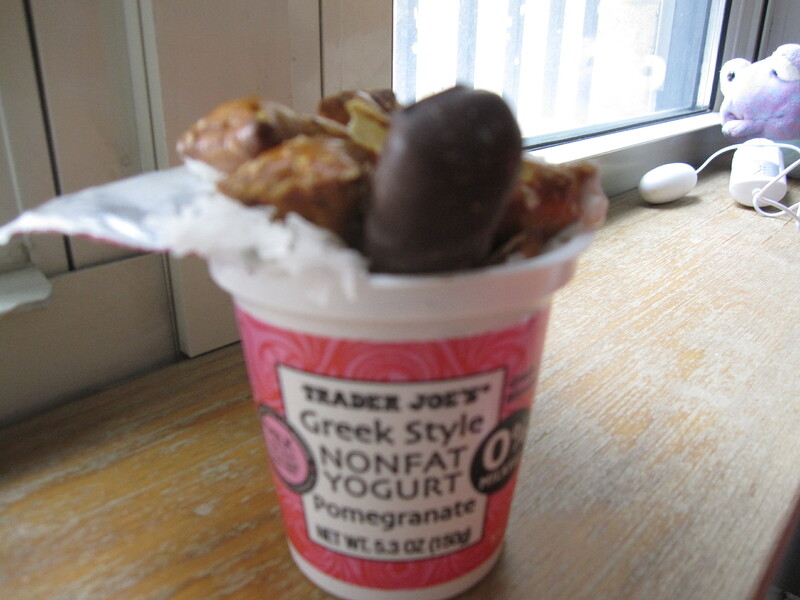 I like greek yogurt for the protein, and as long as I don’t eat more than one serving a day, my tummy feels fine. 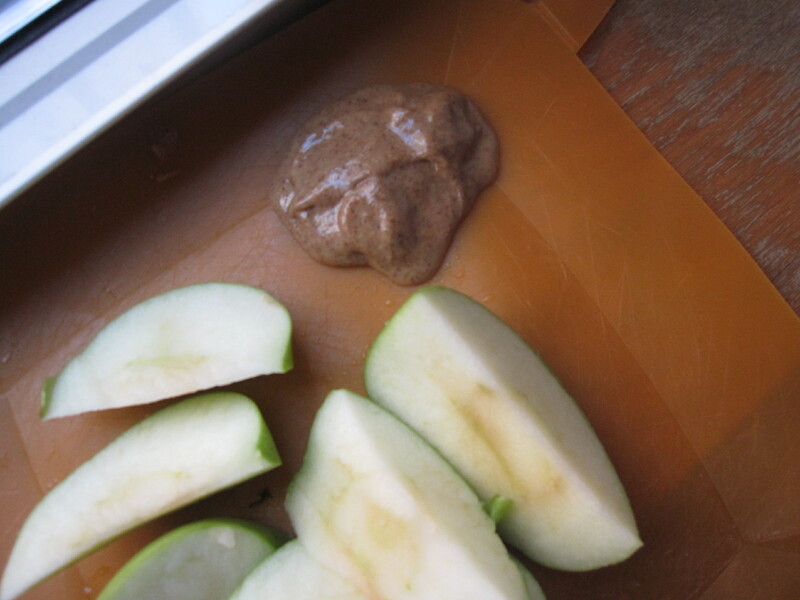 You can get super creative with yogurt mix-ins. 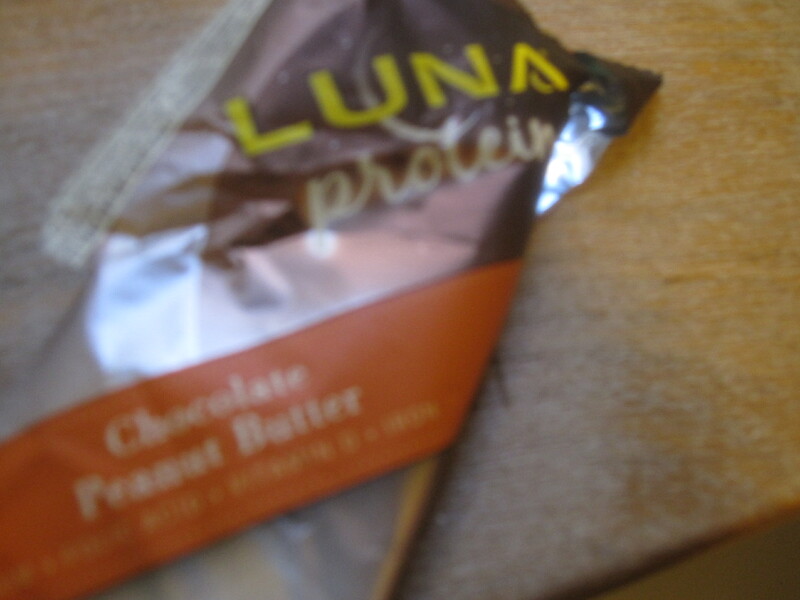 This one had pb pretzels and chocolate raspberry sticks. 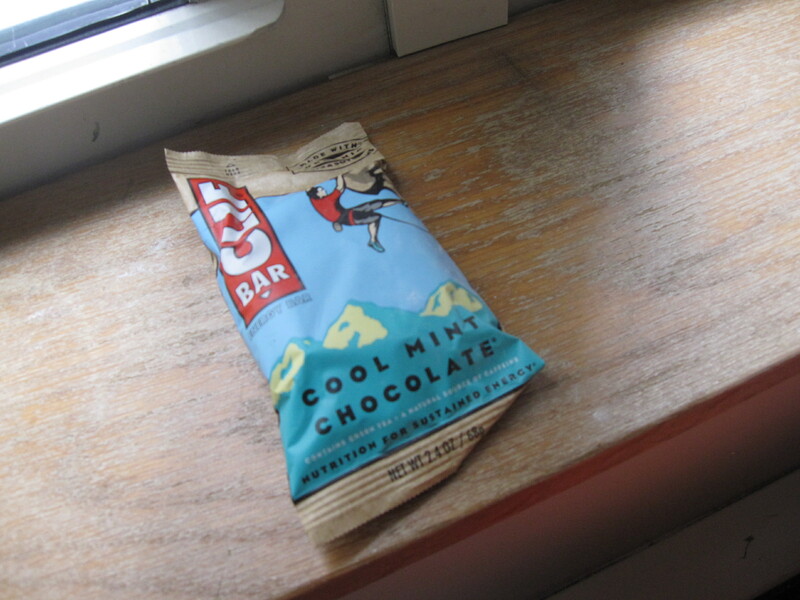 Bars: These are my in-a-hurry or need-calories choices. They can be a bit processed, but some aren’t bad. They usually keep my nice and full, but you do have to experiment to find ones that taste yummy to you. Smoothies! Smoothies can be a super fun but also filling choice. 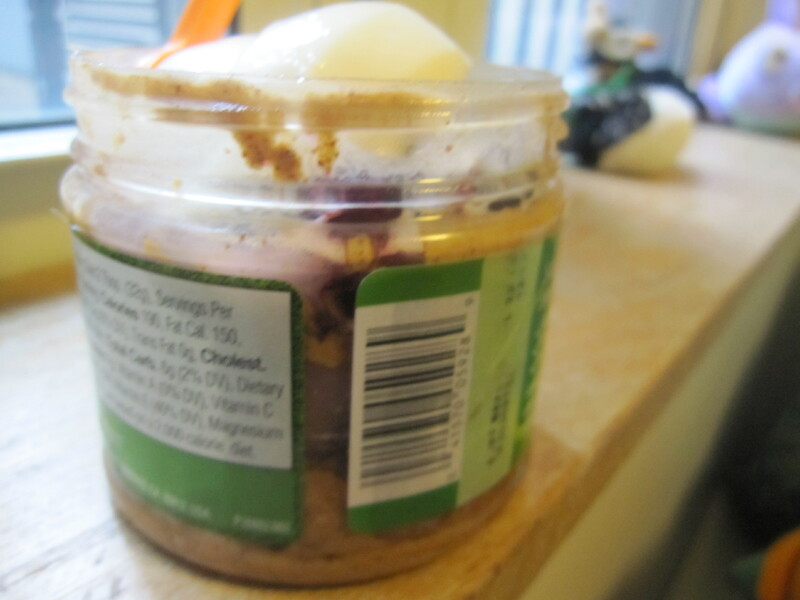 Since I am still blenderless (*tear*), I have to buy mine and add toppings if I want them. 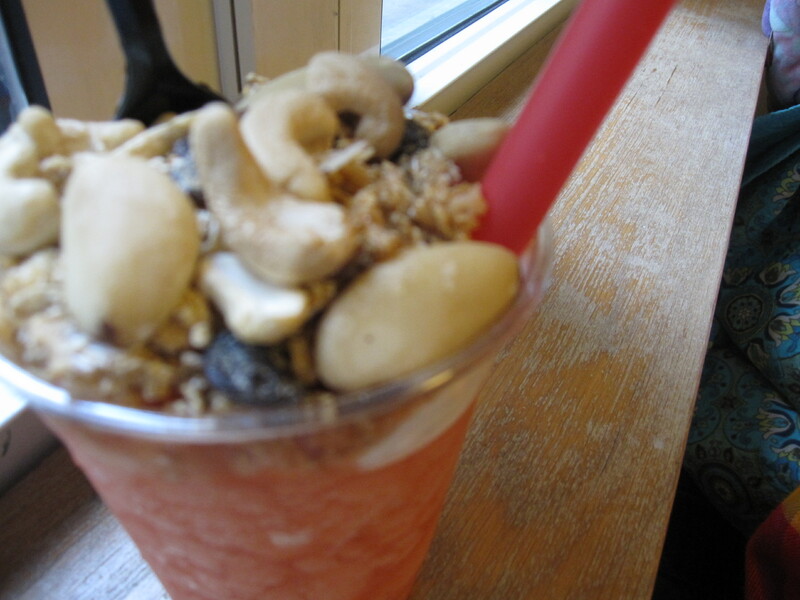 I like a little yogurt and a sprinkle of nuts. Mmmmm. 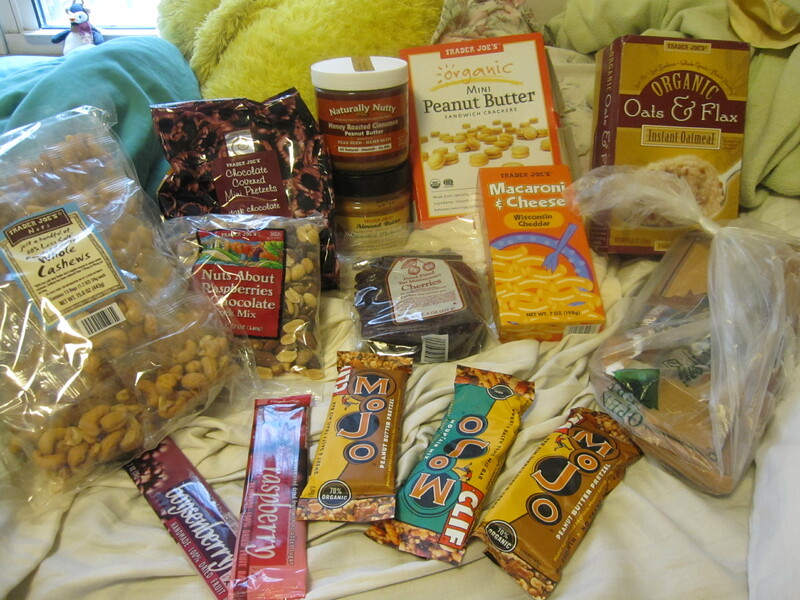 Okay, I think I’ve covered my most typical snacks! I’m looking on doing more protein/savory snacks, since I know that carbs/sweet stuff can be a little bit addictive for me. I’m thinking of plain edamame and hard boiled eggs. 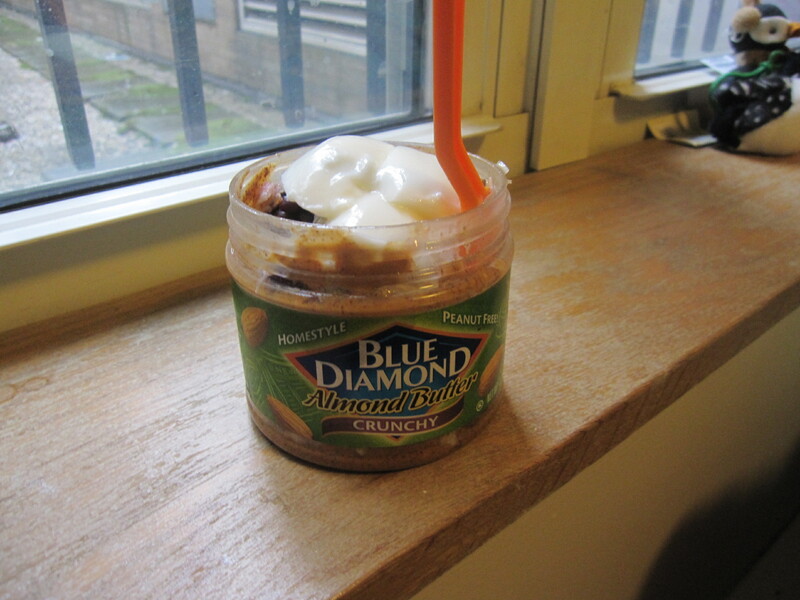 Anyone have any other protein/fat snack ideas? 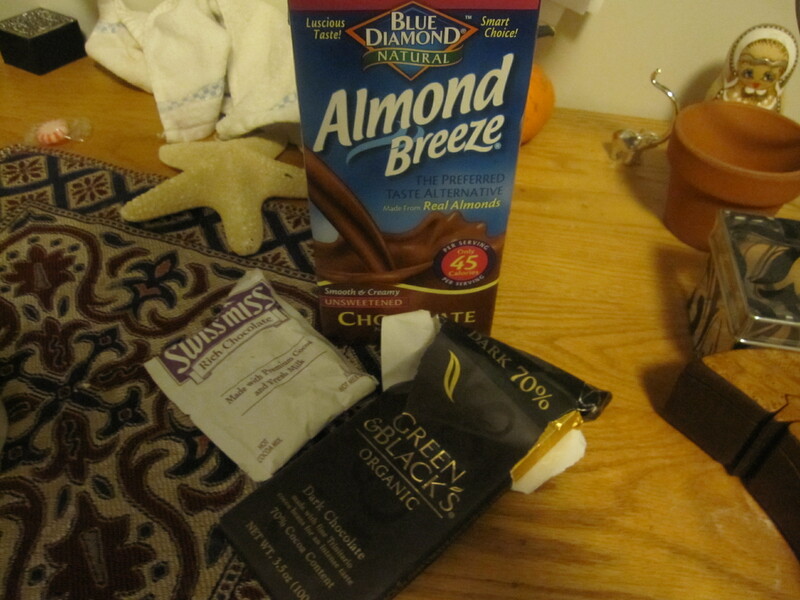 PS — Averie is giving away some awesome Tazo tea stuff here. Seriously, the blog fairies love this girl!